Ramallah : Al Quds University held a scientific symposium entitled ” Future Technologies in Engineering ” organized by the Central Scientific Committee of the Engineers Association Al – Quds Center and in partnership with the Ministry of Communications and Information Technology and The Palestinian Information Technology Association of Companies(PITA). The seminar aimed at supporting engineers especially in the fields of ICTs, helping them to benefit from the technology of the future, contributing to the development of their uses locally, preparing graduates to meet the requirements of the private sector, and improving the opportunities for employment and leadership of engineers. The President of the University of Jerusalem, “This symposium focuses on many areas of future technology and modern technologies used in the ICT sector, which contribute positively to the development of its uses in government institutions or civil society institutions, local government or private sector institutions and Palestinian higher education institutions, On the vital and strategic role of the Syndicate of Engineers and Universities in preparing graduates and preparing them and empowering them with the abilities and skills that qualify them to meet the demands of the labor market and the Palestinian private sector. Abu Keshk said that the University of Jerusalem has developed its strategy, one of the most important pillars of which is to build the ecosystem of the innovation, innovation and entrepreneurship system in order to promote the Palestinian economy in general and the Jerusalem economy in particular, and to build effective real partnerships between Al-Quds University on the one hand and the private sector and civil society on the other. Through the creation of partnerships based on scientific research, pioneering and modern technologies. And through Prof. Abu Keshk expressed his happiness with this fruitful and constructive cooperation with all our Palestinian institutions, stressing the continuity of Al Quds University in promoting and creating more partnerships to serve our Palestinian society. “I am delighted to hold this symposium in this prestigious scientific edifice at Al-Quds University, whose name is associated with the eternal capital of Palestine. The University of Jerusalem is my first stop in academic work in Palestine. Minister Moussa said that such a symposium, which raises contemporary topics, is of great importance. It aims at enriching knowledge and stimulating research and discovery. He said that the topics of the symposium represent the challenge of the age and the hope of the near future, adding that such ideas constitute an opportunity for development and growth. To develop the skills, capabilities and transfer of knowledge to absorb the latest science and technology produced and used to promote Palestine and its citizens. He said that the basic goal of education is to enable people to adapt to the reality in which they live, and to motivate them to change and develop this reality to the best, praising the efforts of the management of Al Quds University, the Engineers Syndicate and the Federation of Information Systems Companies. Such activities are effective and important. 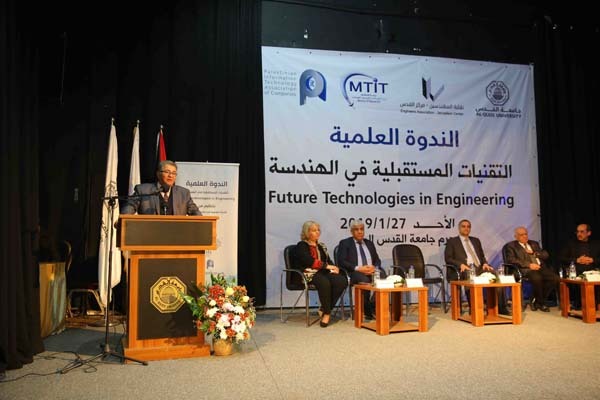 The Chairman of the Council of Engineers Union – Jerusalem Center Jalal Al-Dabbeek expressed his happiness at organizing this symposium at Al-Quds University as the ancient scientific institution and a pioneering national institution, pointing out the importance of the seminar in the need to keep pace with technology to link the development and progress of any country with its technological capabilities. The Chairman of the Board of Directors of the Supreme Council for Creativity and Excellence, Adnan Samara that by 2050, according to studies conducted in the world, many professions will be re-divided, with the technological development and the proliferation of applications of the Fourth Industrial Revolution and penetration of new areas and increasing aspects of economic activity, social and cultural. Eng. Samara pointed out that the Supreme Council for Creativity and Excellence initiated the fourth national forum under the title of “the fourth industrial revolution of creativity and excellence in September 2019, which will include seminars dealing with aspects of the Fourth Industrial Revolution. “Technology in Palestine is one of the most important levers of the global and local economy. On the sidelines of the symposium, the President of Al Quds University, Imad Abu Kishk and President of the Engineers Syndicate d. Jalal Al-Dabbeek A memorandum of understanding aimed at opening up cooperation in the fields of developing engineering work and investing in the resources available to both parties in the development of human engineering resources in Palestine to improve the scientific and professional level of engineers through the implementation of several programs and joint activities. The seminar was moderated by Dr. Samir Abu Eisheh of the Faculty of Engineering and Information Technology at An-Najah University. The seminar focused on the future trends in information technology and engineering. Dr. Rushdi Hammamra of the Department of Computer Engineering at Al-Quds University spoke about the role of information security in Developing the relationship between business administration and solving problems and how to solve them through authentication of electronic certificate and electronic signature. Eng. Nizar Shana’a, Director of Information Technology at the Palestinian Telecommunications Company, spoke on the subject of infrastructure engineering in data centers. Eng. Abdullah Abu Eisha from the International Group for Engineering and Consultancy, “Maalim”, presented the topic of using Big Data in the field of road and transport engineering. The Engineers Syndicate has talked about the reality of the Engineers Syndicate on the IT side, which will be developed to be a leader in the field of trade unions. The second session, which was moderated by Dr. Safaa Nasiruddin, Vice President of Al-Quds University for Jerusalem, dealt with the gap between the academic and private sectors. Speaking at the session, Mr. Muhannad Hijjawi from the Union of Information Technology Companies on the Union’s view of this gap compared to the private sector. Dr. Issam Ishaq of Al Quds University addressed the subject of what the academic center can offer in this field, in particular Al-Quds University. Dr. Yara Al-Saifi from Al-Quds University addressed the incubator of engineers’ exhibitions, and supervised the presentation of a number of students at the university for engineering projects. Eng. Mahmoud Amor from the Young Engineers Company spoke about the graduation projects competition for engineers. Dr. Ahmed Abdu from Al-Quds University presented the success story of the pioneering engineer. Dr. Safa Nasser Al-Din, Vice-President of Al-Quds University for Jerusalem and a member of the Board of Directors of the Girls in Technology Foundation, Technology. Engineer Mahmoud Amor of the Amor Architects Foundation spoke about the Internet’s job opportunities. The symposium was attended by a number of participants and specialists from inside and outside the university, as well as professors and university students. Each session ended with a panel discussion in which the participants participated in enriching information and presenting new ideas that contribute to the use of future technologies in engineering. The fourth scientific symposium is held in cooperation with government and private sector institutions and the academic sector. Al Quds University is one of the leading universities in cooperation and integration with all sectors of society to prepare graduates capable of entering the labor market in line with market needs. Locally and internationally.